Is it safe? There is always risk in and near water.Our coaches are trained to assess the risks and to put measures in place to minimise it. TCKC policies and guidelines clarify how we strive for safety. We ask all members to sign a membership form to say that they have read these documents.Risk assessments and operating procedures for each of our training venues are on the documents section of this website. Is the Club run for profit? No this is a voluntary club and help is required from all members and parents to ensure its future. The Club is for Juniors and we welcome adults to get involved with helping and leading the activities. The Club follows accepted guidelines for Safeguarding Children, which include DBS screening of helpers. The Club Safeguarding Policy is found in our Club Constitution document. What happens when I turn up at canoe polo for the first time? You will be taught how to sit in a kayak correctly and then how to fall out of it correctly! Then we’ll teach you how not to fall out of it! 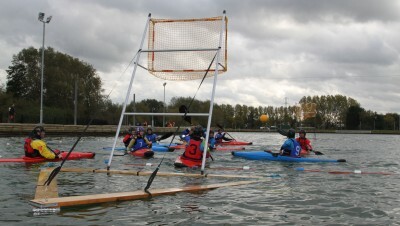 You’ll probably be able to take part in a canoe polo game the same evening. Do I need any special kit to get started at canoe polo sessions You just need to turn up with swimwear, t-shirt and a towel – the club will supply everything else needed. Can I come alone to canoe polo? You must attend either with an adult (parent or friend) or as part of a team accompanied by an adult. Please call our Membership Secretary first to discuss. Why must an adult be present? Our coaches need to focus on coaching so need extra adults to assist with running the sessions and to ensure safety. Adults who are responsible for teams or individuals must be aware of any medical conditions of the juniors in their care and are responsible for their good behaviour. What is Canoe Slalom? Canoe slalom is the ultimate challenge. Paddlers tackle whitewater rapids at speed testing their skills to the limit as they navigate a sequence of gates set up in number order. The aim is to run the rapid river with skill and precision as fast as possible and without any touches.The gates consist of a pair of poles. Green downstream and red upstream. If you miss a gate or go through it in the wrong direction the penalty is 50 points that are added to the paddler’s end time. A 2 point penalty is also added to their time for a touch.You need to be at least a paddlepower level 9 to start Canoe slalom (or at the Blades coach’s discretion). To encourage beginners, we offer taster sessions arranged on placid water. We also regularly encourage new paddlers to take part in a div 4 competition, which is usually on flat water and a fun day out for the entire family. Full coaching support and kit can be provided on these days. For more information speak to any of the Coaches. I have never paddled before, but would like to get some river experience. Where is a good place to start? It is best to build some experience at canoe polo and then speak to the coaches about doing a river trip. What is Freestyle kayaking (playboating) and how does one start? Playboating is a discipline of whitewater kayaking or canoeing where the paddler performs various technical moves in one place (a playspot), as opposed to downriver whitewater canoeing or kayaking where the objective is to travel the length of a section of river. The moves and tricks are often similar to those performed by snowboarders, surfers or skaters, where the athlete completes spins, flips, turns, etc. Specialised boats are often used. Playboating requires a certain level of skills and confidence on whitewater and at least a BCU 2*. For more information speak to any of the coaches. What is the clubmark logo on the home page and why is it there? It is an Award from Sport England recognising that a sports club is open to all, is safe and well run and has an active programme for the benefit of the community. What are Top Club and Top Club Gold? Top Club is accreditation from British Canoeing that is awarded to canoe clubs. Top Club involves a detailed audit of the club’s policies, procedures, activity programme, member, volunteer and coach training and development. A Top Club Gold is the highest achievement awarded by British Canoeing in recognition for strong management, performance and being a highly active club. Do you issue membership cards? On payment of the annual family membership fee, you become a member. We do have cards that are only issued on request (but they normally end up soggy in bottom of a bag). You can get discount in certain canoe retailers with the card. Ask the Club Secretary if you want a card. Click on ‘contact us’ at the bottom of the page to send an e-mail. See below for British Canoeing Membership. Is the club insured? 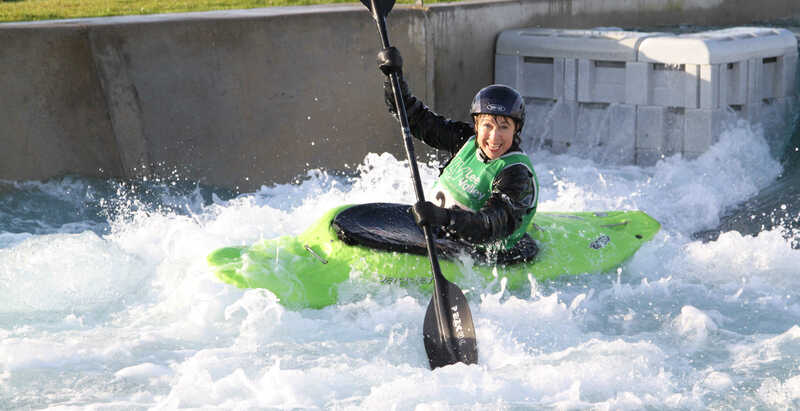 Yes – we are fully insured through our affiliation to British Canoeing for 3rd party indemnity. Do you go on away day trips? Yes, many are organised throughout the year – see the Events Coming Up page. Do I belong to the British Canoe Union if I join TCKC? Our club is affiliated with the British Canoeing, which means you all have Basic British Canoeing membership. Members pay a lower test fee for 3 & 4 Star tests and if you are taking part in BCU events at entry level (e.g. slalom division 4) you do not need to pay the insurance fee. If you are promoted to Division 3 slalom you will need to take out British Canoeing Comprehensive Membership. If you are likely to be involved in these activities please ask the Club Secretary for a membership card. What is the difference between a canoe and a kayak? A canoe is paddled with a single bladed paddle and originates from the Canadians who initially used their carved out logs.A kayak is paddled with a double bladed paddle and originates from the Eskimos who wrapped themselves warm and tight inside their boats using skins to insulate themselves from the cold. 1. Thermal layer for warmth. Choose something that won’t retain water (beware of merino wool – it has great thermal properties, but retains too much water for watersports use). 2. Windproof layer. If you choose a windproof layer with thermal lining, it will probably be too hot for summer,so separate layers give greater flexibility. This is a good combination: Thermal base layer, windproof layer: top – whitewater Cagoule. Bottom – Dry Trousers. Little luxuries: if you get cold feet – fleece socks & if you get cold hands – neoprene mitts with cut-away palms approximately. I am doing DofE Bronze this year and I would be interested in doing the basic refereeing course as my skill section. Could you let me know how to go about doing this skill please? You need to take part in a training course which we have designed and run ourselves at Tandridge Pool. You will need to learn new polo rules each week. Look at the information page for an idea of what you’ll need to learn.There’s a download of referee rules on the Useful Docs page. There’s a set of slides on the Home Page. You will need to attend on the nights that you don’t play polo so that you can referee. If you learn everything and turn up regularly to referee, then you can get your book signed off in one or two terms. There are two tests at the end – a written paper and a practical assessment. CANOE POLO – DATES FOR YOUR DIARY!